San Francisco BOOTIE SF: Adrian A’s Belated Birthday! Everybody loves celebrating their birthday at Bootie -- even if it’s a little late -- and Bootie DJ and co-creator Adrian A is no exception! For their special night, Adrian picked out all the DJs and performances, including picking out all the songs in Smash-Up Derby’s set at 11 PM! Come out and celebrate! Four rooms, one price! Bootie co-creator and DJ Adrian A celebrates their belated birthday at Bootie, and you get all the presents! Adrian A will spin a special prime-time birthday set, while resident DJs Tyme and Dada keep the party rolling all night long! 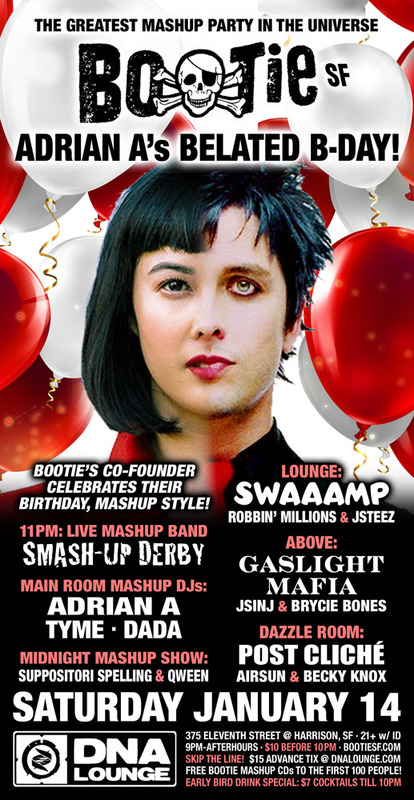 Taking the stage at 11 PM for a special birthday mashup set will be Bootie’s own house band Smash-Up Derby, plus drag hosts Qween and Suppositori Spelling perform the Midnight Mashup Show. Upstairs in the Lounge, it’s Swaaamp, as disco, house, and more gets purposely pitched down 10% for a thick, swampy, bent and funked-slowly sound, while in Above, Gaslight Mafia manipulates classic swing and jazz with modern sounds, with special guest Brycie Bones. And Post Cliché takes over the Dazzle Room, keeping you moving on the dance floor! Plus club photographer ShutterSlut capturing the fun, and FREE Bootie mashup CDs to the first 100 people!